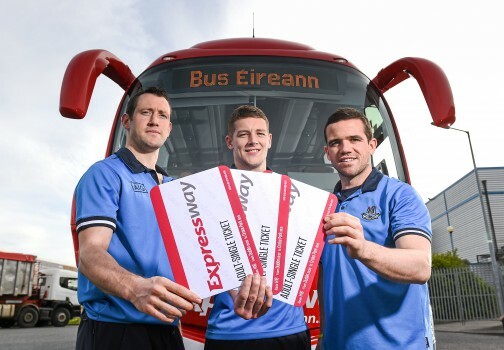 National tickets are standard Bus Éireann bus tickets valid for travel within the Republic of Ireland. Once your credit card details have been processed, you will be sent an e-mail confirmation with a validation code. You then print that e-mail or display on your mobile device and present it at the Bus Éireann ticket office or to the bus driver before travelling on the bus. You must present this e-mail otherwise ticket cannot be issued. The ticket clerk or bus driver will check the validation code electronically and then issue you with the appropriate travel ticket in exchange. The ticket issued by the Bus Driver or ticket clerk must be retained for your return journey and you will require that ticket for return journey. Customers please note you may also be asked to produce photo identification when collecting your e-ticket, e.g. Valid Passport, Driver's licence with photo, International Student Identity Card, CIE Photo ID Card, National ID Card, Bus Pass with photo or Work ID with photo. Customers accessing this website may buy National tickets online for journeys between up to 500 popular destinations throughout the country. Bus Éireann serves over 3,000 locations nationwide so it is not yet possible to buy tickets online for all destinations. The online ecommerce system is undergoing further development and will be expanded over time to include additional destinations. Return Tickets - valid for one outward and one inward journey only, they are not valid for two journeys in the same direction. Ordinary Monthly Return Tickets - valid for one outward journey on date of issue and for return journey for up to one month from date of outward travel. Day Return Tickets - valid for one outward journey on date of issue and for return journey on the same day. Weekly 10 Journey Tickets - valid for 10 journeys as specified for a period of seven consecutive days inclusive of date of issue and including Sundays, e.g. a weekly ticket issued on Tuesday is valid up to and including the following Monday. Family Return Tickets - valid as Ordinary Monthly Return Tickets are issued to family groups consisting of one or two adults and up to a maximum of three children under 16 years of age. Claims for refunds in respect of unused tickets will be considered solely at the discretion of Bus Éireann and will be subject to such administration charge of €5. 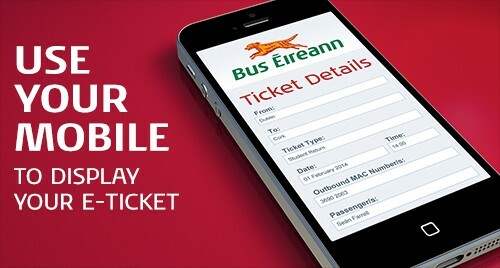 Bus Éireann customers can use their mobile device to display their e-tickets. No more last minute dashes to printers, no more worries about empty ink cartridges and paper trays, all you need now to board our coaches, is the phone in your pocket. It’s just a small part of our ongoing process to improve every journey you take with us. Using your mobile to display your e-ticket is easy. Open your email displaying your ticket details on your phone. The driver will then enter your MAC number on the ticket machine and print out your ticket. All that’s left is to sit back and enjoy your journey. All Bus Éireann tickets are issued subject to the Conditions of the Company. Customers should CLEARLY display the ‘Ticket Details’ section on your mobile device and display to the bus driver when you travel. Tickets cannot be issued if ticket details are not CLEARLY displayed. Please keep your MAC Numbers confidential. Customers please note you will be asked to produce photo ID when collecting your ticket, e.g. Valid Passport, Driver’s Licence with photo, International Student Identity Card, CIÉ photo ID card, National ID card or Bus Pass with photo.